Abu Dhabi Oil Refining Company (TAKREER) was established in 1999 to take over the responsibilities of refining operations from Abu Dhabi National Oil Company (ADNOC). This covers the crude oil and condensate refining, supply of petroleum products and production of granulated sulphur. Takreer’s main objective is to develop the refining industry in the UAE which started with the inauguration of Abu Dhabi Refinery (ex. 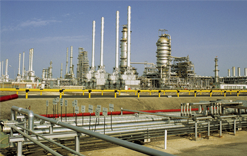 Umm Al Nar) in 1976 and Ruwais Refinery in 1982. Takreer is considered a prominent oil refining company regionally and internationally contributing to oil markets and to the rapid growth of UAE economy. Since our inception, Takreer maintained its position as a leading refining company, thanks to the high standard and efficient refining operations consistent with sound health, safety and environment practices as well as the world standard performance of both operations and employees. Please contact IOS for more details and Interview Date Confirmation.